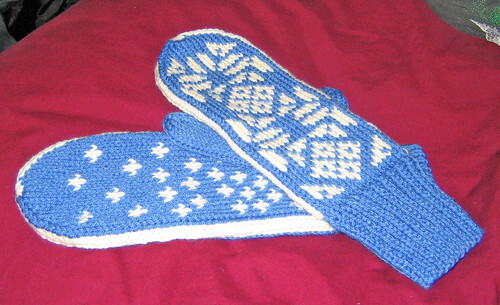 Needle Exchange » Snowdrift Mittens: Done! I had to cut into it last night and make a hole for a thumb. Yes, that’s right, I forgot the thumb hole when I was knitting the second one. I’m so embarrassed. Pattern: a modification of the pattern here. Dimensions: slightly too long, but I’ll make alterations when I can compare them to my aunt’s hands. wow eve, those look great. good for you. I have a bit of a mitten/glove obsession and those are great! Very pretty. Thanks! I’m excited to give them to my aunt. As soon as I figure out how long her hands really are, I’m going to rip back and reknit the tips and line them and everything. It’s going to be great. This entry was posted on April 26th, 2006 at 10:33 pm and is filed under Finished Projects, Mittens. You can follow any responses to this entry through the RSS 2.0 feed. Both comments and pings are currently closed.